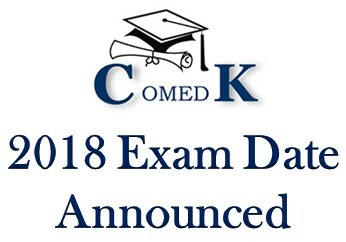 Home > News > COMEDK 2018 Exam Date Announced! COMEDK 2018 Exam Date Announced! COMEDK, also known as Consortium of medical engineering and dental colleges of Karnataka has announced the COMEDK UGET exam date for the year 2018. The COMEDK UGET Exam is scheduled to be conducted on 13 May 2018. COMEDK UGET exam is computer-based and is a state- level examination to offer admissions to the students who are interested in engineering and architecture courses offered by institutes and colleges which are affiliated to COMEDK. Candidates from all state can apply for the exam. Scroll down below to know about the eligibility, exam pattern etc. The Candidates must have studied Physics, chemistry, and Mathematics in English in their last two years of study (10+2 or any other equivalent qualification). The General candidates should have passed Physics, Chemistry, and Mathematics individually with the average percentage of 45% and 40% for SC/ST/OBC candidates in Karnataka state. A try in COMEDK entrance exam for the students who are seeking admissions in engineering courses is counted appropriate for counting in the rank list. NOTE: Diploma candidates are not permitted to give exam as there is no lateral admission. The General candidates should have passed 10+2 or any equivalent qualification exam with Mathematics along with other subjects with the average percentage of 50% and 45% for SC/ST/OBC candidates in Karnataka state. The candidates seeking admission in Architecture should have appeared in the National Aptitude Test in Architecture(NATA) which is conducted by the council of Architecture and the student should have scored 80 or above 80 out of 200 (Both general and other category students). There shall be no entrance exam for B. Arch admissions. COMEDK 2018 exam pattern is same as the last year's exam pattern. The questions will be divided into three subjects Physics, Chemistry, and Mathematics. The exam language will be in English. Each question contains 1 mark. There will be no negative marking in the exam, therefore, students can give their exam with relief.